It seems like as long as I can remember, it always comes down to me and my dad, and a horse. I've made it no secret that my parents were the ones who fostered my great love of horses. I had a pony from the time I was old enough to sit on one alone, and before that, I spent enough time on the front of a saddle that I actually have a recollection of a real trail ride when I was about 2. My mother and father took a lot of pride in the breeding and training operation that they ran and we always had good, sound, sane horses and a steady guiding hand. Together, they supported us, but I have more than a handful of memories of my dad and I and a horse. My dad is a fine horseman. He has just the right touch of "cowboy" to look at things logically and get them done when it comes to a horse. He is compassionate and though he hates to admit it, cares very deeply about our animals - he'll hate for me to admit it - but I have seen the tears in his eyes with every dog young and old that we have put down in the last ten years. He is an excellent father - he will let you make your own mistakes, learn your own lessons, and be there at the end to make sure you got the lesson straight, and comfort you when you've made a mess. My dad would give the shirt off his back or all of his waking hours to help a neighbour and if I someday have children who have a father who is even half of the man that my father is, I will be a blessed woman. My father and I are more alike than we like to think. We are both fairly sociable animals, both of us are a little bit emotional. We both can have the patience of Job at some aspects of our lives and absolutely no patience in other areas. It frustrates the both of us when someone or something does (or doesn't do) something because they "should know better". The first place either of us will usually go to cool down after an argument or a blow out or when we're just feeling down is the barn. And so I remember... 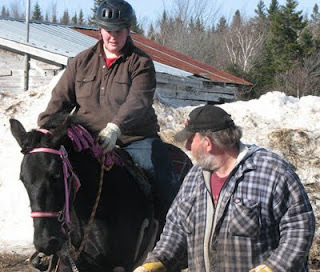 I remember when I was 16 and my father who had been a trucker and only sporadically present most of my childhood came home off the road and tried to step immediately into an authoritative father role and I balked at the idea, and we finally came to see eye to eye across the withers of my old sorrel gelding, Boots. I cried a lot of tears into Boots' mane when we were struggling to understand one another, and so it was fitting that we figured things out with Boots standing between us. I remember when I was 20 and my Angel was dying and we both knew it and we stood in front of her stall and he watched me say my last goodbye to her and he ushered me into the house so that I didn't have to see her final painful moments. I remember him standing in the doorway of my bedroom while I cried and cried with her silly poofy pony forelock that I hated so much - I don't think he knows how much grief that little braid of hair got me through after losing her. I remember him telling me that "everything happens for a reason" and me resenting that for over a year... until Bronwyn came into my life and I began to realize what a profound role she would play in my life. I remember when I first got Bronwyn and we tied her for the first time so I could give her a good grooming and he stood with me while I painstakingly combed tangles out of her tail while trying not to move too quickly and frighten her. When he tied her in her straight stall for the first time, when he held her so I could swing my leg over her for the first time, when he later told me that he had had his concerns about her hurting me but that first time that she let me sit on her and I sat there with confidence, that he would never doubt the mare again. When he hauled me to our first trail ride, and then our first horse show and when he rode shotgun with her while I tried to figure out how to pull a trailer with a horse in it for the first time. When he played doting groom and ribbon holder at the quarter horse show and held her for me at our first trail ride and tried to play nice even though the two of them are not the best of friends. I remember when I first doubted being able to ride as an overweight rider. When my dad said "stop worrying and just ride", when he reminded me "you're not going to hurt that horse". My daddy is many things, but he is not a liar. He may have had to say it to me a million times, but eventually - I believed him. It is largely because of him that I began to write this blog at all. Really nice post. You have a great father. Every girl should be so lucky. That was beautiful. I <3 your dad. He reminds me so much of my own. They must be the last 2 good men on Earth. Give him a hug for me and tell him I said happy father's day! !